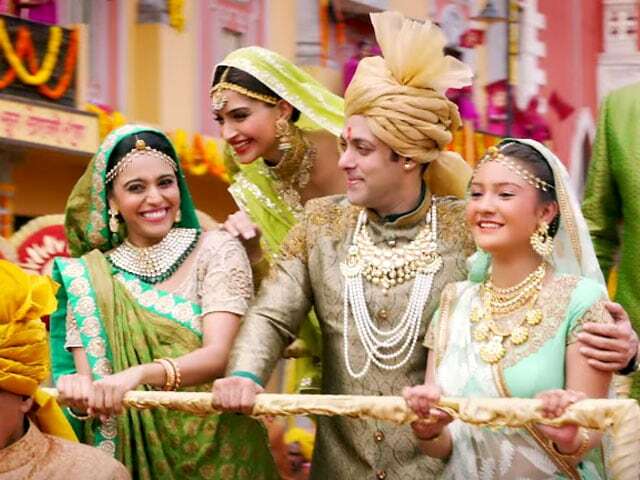 The overwrought PRDP might not be that bad, but it is syrupy to the point of being unendurable. Only for Salman Khan fans. It is obvious that Sooraj R. Barjatya has spared no expense or effort in erecting the ornate sets and designing the unabashedly garish look of Prem Ratan Dhan Payo. But one crucial aspect of the film that would have cost little or no money (the director is himself the writer) but taken far greater effort ? the screenplay ? is completely neglected. As a result, this overlong and bloated story of a sad and lonely prince ? a man who would be king ? is told in an old-fashioned, overly melodramatic style that simply does not work in this day and age. This painfully dreary and tedious film relies far too heavily on Salman Khan ? he plays a double role ? to liven things up. The swaggering superstar who was a Hanuman acolyte earlier this year in Bajrangi Bhaijaan, is, one of his avatars here, a devoted Ram bhakt this time around. He plays Prem Dilwale, the star attraction in a Ram-leela troupe based in Ayodhya. He is also seen in the guise of a ruler of a small principality that is gearing up for an elaborate coronation. If stray parts of PRDP are somewhat watchable, it is only because of Salman?s ability to breathe life into the most ridiculous of situations. There is, of course, no dearth of the ludicrous in this film. Especially implausible are the laboured song situations. One of the musical set pieces is mounted around a game of football that pits men against women. It is meant to deliver a blow in favour of gender equality but can only be described as infantile. Yes, PRDP is also about a philanthropic princess (Sonam Kapoor) who runs a charitable foundation and a successful garments business in Delhi. She is shown early in the film supervising a flood relief camp where Prem Dilwale sets sights on her and develops a crush. The tale is set in present times, but owing to the way its pans out and because of the anachronistic feel of the setting, it reeks of times gone by. When a contemporary drama looks and sounds like a period extravaganza, it is apparent that there is something seriously wrong in the way it has been conceived and executed. The characters, too, are hopelessly stilted. Not even the two pivotal male figures, one of whom serves as a decoy for the other for a large part of the film, come across as a believable humans capable of feeling and expressing real emotions. Simply put, what PRDP tries to impress upon its audience is that, lucky are those that have the support and love of their families. Here is a prince who has everything going for him, but he has nobody that he can call his own and bank upon for emotional solace. His step-brother (Neil Nitin Mukesh) is tired of living under his shadow and gangs up with the royal estate?s CEO (Armaan Kohli) to turn things around for himself. The gloomy prince also has two half-sisters (Swara Bhaskar and Aashika Bhatia) who cannot bear the sight of the man because they believe he has deprived them of their rightful place in the palace. The princess that he is engaged to also has a litany of complaints against him. The Ram-leela actor from Ayodhya is plonked into this loveless world along with a friend (Deepak Dobriyal). The two commoners teach the bickering royals a thing or two about family bonding. PRDP is a film about family, love and friendship that wants to make all the right noises but does not seem to be aware that the language for that kind of communication is no longer what it was when HAHK?s Prem spread love and laughter over two decades ago. Had the duo of do-gooders taken less time in achieving their end and had Salman Khan been a given a more naturally gifted female co-star than Sonam, PRDP might have been an infinitely better film despite the vapidity of the script. Salman gives this weightless film an occasional push and a shove in the right direction, but Sonam drags it back with an unconvincing performance. Gawky, giggly and gloriously gooey, she is completely out of her depth here. None of the other actors in the cast is allowed to be anything more than a glorified extra. Swara Bhaskar, despite being saddled with silly scenes and lines, is about the only one in this crowd who manages to climb a few notches above the mediocrity all around. In one scene, a camel gobbles up Prem?s little diary. He warns the animal: hazam nahi hoga, diarrhea ho jayega (you can?t digest it, you?ll get diarrhea).